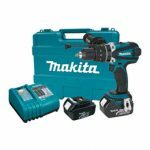 When you have lots of holes to drill in concrete, you need a more powerful tool than a hammer drill. When you want to pull up tiles, break up weld spatter, and bust up rock, you need a rotary hammer. Let’s examine two of the best models on the market to see which one is right for you. 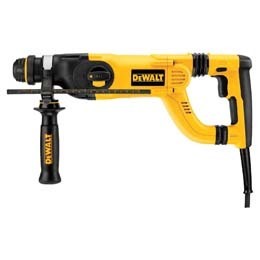 If you compare the impact energy of the DEWALT’s D25263K rotary hammer to that of the Bosch RH228VC, it’s almost a tie. 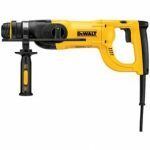 DEWALT’s tool puts out 3 Joules of impact energy, or 2.2 foot-pounds, compared to the Bosch’s 2.4 foot-pounds. But there is a lot more to consider beyond the power rating. 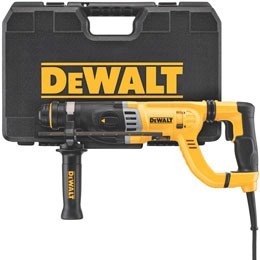 For example, at 6.8 pounds, the DEWALT D25263 weighs a bit less than the Bosch. Even more important, it has the SHOCKS Active Vibration Control that diminishes the motion that the user feels. In fact, the rotary hammer is rated for 9.8m/s2. This fact makes it safer than other similar tools for long-term use. In combination with the active anti-vibration system that reduces the risk of nerve damage, the D25263 has an integral clutch that cuts down on high-torque reactions if the bit gets stuck. This design is essential since the rotary hammer can run full speed in both forward and reverse directions. The D25263 has a variable-speed trigger that’s large enough for two fingers. That alone relieves hand fatigue. The D-handle is large enough to accommodate gloves, and it has a soft rubber-coated grip, too. What can this rotary hammer do? 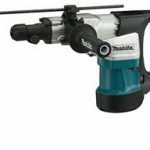 Besides drill in concrete up to 3/4” (or more, since this is their recommendation), it can do chipping and other tasks, depending on the bit you choose. And you can lock the bit into horizontal or vertical position. That’s handy since the rotary hammer is 17.5 inches long. Finally, this tool uses SDS+ bits. There isn’t one included in the box, but you will get a side handle and a depth rod, along with a carrying case. The side handle rotates 360-degrees so you always have a comfortable grip. 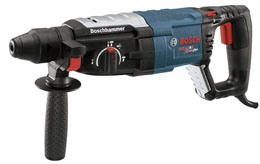 The Bosch RH228VC rotary hammer weighs just a tiny bit more than the DEWALT D25263, but it squeezes a little more power from a lower-amperage motor. Of course, it has an integral clutch to reduce torque reactions if the bit jams. And it has a counter-balance vibration system. Bosch says their counter-balance system cuts down on vibration in the hammer mechanism itself. The result is 30% less shake than competitor models. But they don’t display a precise measurement, nor do they say which competing models they use as a reference. But the fact is still the same—lower vibration means less risk of nerve damage. This rotary hammer is very handy on the job site. It has three modes of operation: drilling only, chiseling or hammering, and hammer drilling. If you’ve forgotten your drill, but have the right bits on hand, you can still get the job done. Just like the DEWALT, the Bosch uses SDS+ bits. Depending on which ones you purchase, you can drill, chip, and chisel in a variety of materials, from plastic to metal, or concrete and rock. Because of its versatility, Bosch recommends this tool for a range of professionals, from HVAC technicians to concrete contractors. 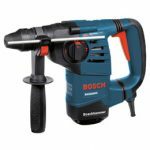 Another reason why pros like the Bosch RH228VC is its ability to rotate a chisel into forty different positions, but maintain up to 1230rpm and 5460bpm. This feature is called “Vario-Lock,” and it’s very useful when you’re working in a tight spot. Finally, the cord on this tool is long enough that you might not even need an extension. Plus, it’s mounted on a turret that pivots up to 35 degrees so it can stay out of your way. But if you’re a fan of the black and yellow DEWALT line of tools, you’ll still get a dependable, powerful tool in the D25263K. And you’ll also have the peace of mind that it comes with an industry-leading warranty. 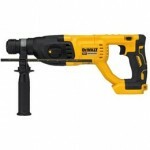 Click here to purchase DEWALT D25263K on Amazon.com! 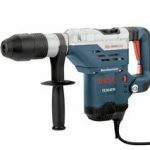 Click here to purchase Bosch RH228VC on Amazon.com!